Blue Mountain’s Achilleion website recently won a Gold award from bestweb.lk in the ‘Best Advertising and Marketing Website in Sri Lanka’ category. The governing body for all .lk domains in the country, bestweb.lk launched the awards programme to recognise the most creatively designed and effective websites in Sri Lanka. 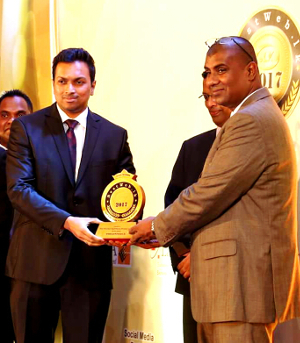 Dr. Hiran Hettiarachchi – Group Chairman, Blue Mountain Group, received the award on behalf of his team at an exclusive ceremony, which took place at Galadari Hotel, Colombo, on 4 April. The Achilleion website (www.achilleion.lk) conveys the epitome of seven-star luxury living that the iconic apartment complex is renowned for.